The McGill Management International Case Competition (MMICC) is a world-class undergraduate competition that focuses on globalization, innovation and multidisciplinary thinking. For 17 years, this event has invited schools from more than 20 countries to Montreal to demonstrate their business prowess. 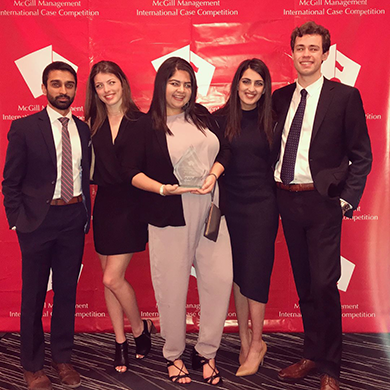 This year, the Lazaridis School of Business and Economics was invited to participate at MMICC, where fourth-year BBA students Trisha Sharma, Tomas Marek, Sania Lalani and Katherine Beeson found themselves standing proudly on the podium. While a traditional case competition, there are some unique features to MMICC. First, the teams are not divided into pools to progress through a variety of cases. Instead, each team is given one case to crack, and 32 hours to do it. Second, the teams present their solutions twice to two different judging panels. This means each judge sees each team present. Scores are then aggregated and winners declared. And, finally, to level the playing field, MMICC only allows passive internet use. Meaning schools with access to more resources and information are not given an advantage at this competition. All information accessed online needs to be free and available to anyone. Through these rules, MMICC seeks to level the playing field, truly showcasing the students’ understanding, knowledge and ability to present clearly and concisely. These results are the outcome of a team effort: Instructors always working to improve case training, alumni willing to watch and provide feedback, and outstanding students willing to put in the long hours of preparation.